Andre Breton (1896 - 1966), was a poet, essayist, critic, who with Paul Eluard, Luis Buñuel, and Salvador Dali founded the Surrealist movement. André Breton was born in Tinchebray (Orne) to a modest family. But from an early age he showed a preoccupation for intellectual endeavors, studying medicine and psychiatry. His interest in psychiatry led him to literary studies, founding the magazine Littérature. In 1924 he published his Manifeste Du Surréalisme. Obsessed with the inner functions of the unconscious mind, he saw in the paintings of Hieronymus Bosch and James Ensor glimpses of what writers could achieve with text, which explains his poetic fugues into the irrational, dreams, l'humour noir, and the bizarre. In 1927 Breton became a member of the French Communist Party, breaking with it in 1935 as a reaction to Stalinism. When the Nazis occupied France, Breton together with Marcel Duchamp and Max Ernest came to the United States. He returned to France in 1946 where he lived most of his productive life. André Breton died in Paris on September 28, 1966. A man of conviction, Breton wrote every day on different topic. As an opinionated writer he became a magnet for artists and intellectuals. So sure was he of his studies and opinions that he bordered on arrogance, often alienating some of his followers. Having met Sigmund Freud and studied his works, he sought other luminaries —the revolutionary Leon Trotsky and the anthropologist Claude Lévi-Strauss, for example— to observe their minds. Labeled a romance rather than a novel, Nadja is really a literary hybrid: mixture of romance, novel, fantasy, and poetry. If one wished to capture its essence in a few words, we could say that Nadja is the diamond of surrealism. Not perfect, not the most brilliant of all of Breton’s work, nor dazzling in its style—yet it is a literary masterpiece. To complement Breton’s Manifesto of Surrealism, with Nadja Breton concretized what the surrealists were trying to convey as an avant garde movement. In this novel we find the major elements of surrealism: ordinary life, ordinary artifacts, art, and human emotions all woven in a tissue of dream and reality. The novel is told by a first-person voice which presumably is the author’s. Nadja is a character, a fictional entity —though based probably on a real person— a gossamer of a heroine that moves around Paris. At times she is a free spirit, restless, haunting, and demanding; at other times she becomes an incarnation of madness. What gives Nadja depth is the mixed media that one finds in the text and between the covers— a veritable artistic collage, its prose is supplemented with photographs (44 in total), including sketches of Nadja herself, transcripts composed of paintings, photographs, all presented in unexpected chaotic flights that leave the reader’s mind reeling with disorder and wishing for logic. Yet the work only follows the logic of dreams—displacement, condensation, and symbolism. In his novel Aurelia, Gerard de Nerval writes in his opening sentence: “Our dreams are a second life.” What Breton seems to say in Nadja is that dreams are our first life. 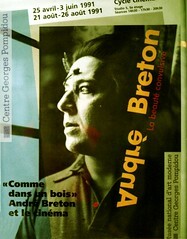 In the 1940s and 1950s Breton published many essays and collections of poems: ARCANE 17 (1945), and CONSTELLATIONS (1959). Comments on "How to Become a Writer: Andre Breton's Nadja"